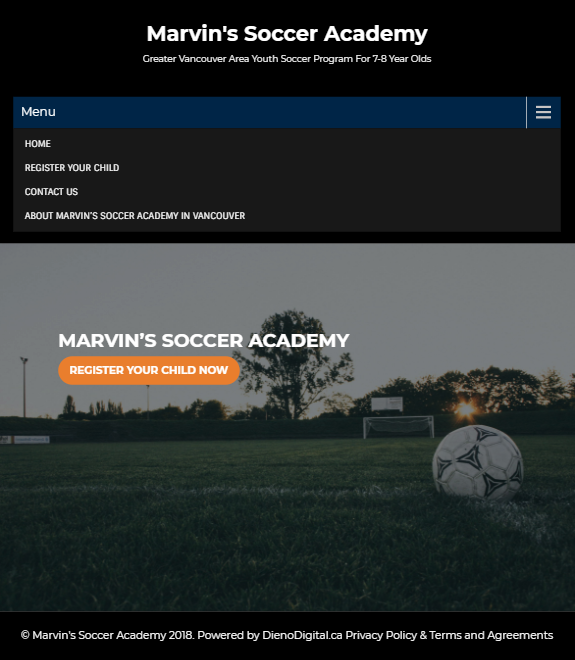 The objective for this project was to quickly turn around a fully functioning website that would allow parents to register (and pay) for their children’s enrollment in a new soccer academy for 7 to 8 year olds. An affordable website needed to be built that was agile and could quickly be updated. An online credit card processing solution needed to be implemented. Parents (customers) needed to be able to register with their personal information and also register their child. The website needed to be fully optimized for search engines, responsive and extremely easy to use. We decided to build the website on the WordPress Platform as it is commonly used and because of the budget a template could be utilized as the initial framework. Utilizing an existing template often allows us to avoid hours upon hours of development work coding a website from scratch. A simple contact form was built that e-mails the site owner when used, and the site was fully optimized to show up in google. With a solid content plan this website will rank for very competitive keywords in it’s target market in a short amount of time. The template was modified with CSS to ensure that both the desktop and mobile experience were seamless for customers and quickly presented the needed information and got the customer into the funnel to make a purchase. For the e-commerce portion of this build, we integrated WooCommerce with the website which is a fully functioning e-commerce platform built for WordPress. Using customized and additional fields we presented the purchasers with extra fields to enter their child’s information upon registration and payment. WooCommerce can integrate with every major online credit card processing system, but for this particular build we went with Paypal as it is universal and also gives customers an additional layer of security. Standard technical specs were implemented such as SSL (HTTPS) and Caching to ensure the site loads securely and quickly on all browsers. The site took 3 weeks to build and fully implement, including graphic design work + coding and testing. If you are interested in learning how we can bring your project to life Contact Us.